So I wanted to answer a few questions about Compassion. If you have more - I'd be happy to add on to this post and try to answer them. 1. First - how did I get to go on this trip and how can you go on one? I was asked to go on this trip. Compassion has taken four trips now with groups of bloggers. You can go back and read about the trips HERE. You can also submit your blog to be considered for future trips. Keep in mind they like to have blogs who have pretty high traffic because the idea is to get the word out and tell the story of Compassion to as many people possible. 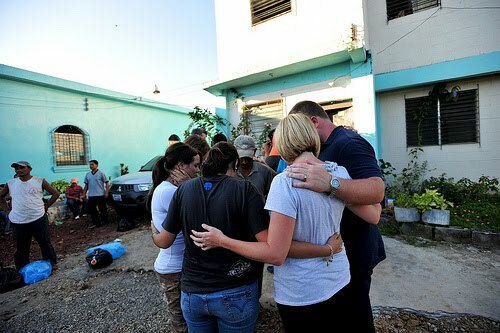 BUT Compassion also takes group trips that you can go that would be very similar to what we just did. I told Scott last night I would rather go on another trip like this one than go to the beach. Sure I love relaxing in the sun and eating shrimp at night but hugging little children and realizing that you are SO blessed and making a difference - is priceless. 2. What if you can't commit to sponsoring a child? Can you make a one time donation? ABSOLUTELY - go HERE and you can help with disaster relief (like the hurricane that hit El Salvador) or to the Child Survival program or to clean water projects. This is just as impactful! 3. Can I send my child something besides letters? Just because of the cost this would involve - they don't allow packages. This would increase costs to Compassion and might take away from the actual support of the children so they ask that you just send letters. You can make extra donations to your child. The family does not receive the money. Instead - leaders of the project that child is at will find out the needs of that child - food, clothing, medicine, school supplies - and buy that amount and give it to them. They keep all receipts of what is bought and meticulous records. 4. Do you only support children as long as they become Christians? NO! We support children of many faiths but the goal is to relieve them from poverty in JESUS name. The gospel is taught to these children and 95% of them do come to know the Lord. It is not forced upon them but rather shared in love because we don't only want to fill their material needs - we want to fill their spiritual needs. It is a Christian organization that works through evangelical churches and it does not apologize for that! 5. What if I have to stop supporting my child? Compassion will keep your child in the program and give them the same support they were getting previously and that is funded by general donations. They will try to get them a new sponsor. 6. How have I changed since going on this trip? I don't think it has made me more giving because I have always had a giving heart and I have always known that God has blessed me WAY beyond what I deserve. I always try to look for ways to give. Most of the time when I hear any kind of need small or big - I try to do something to help. But I think it just opened my eyes even more to how much WE have and how parts of the world have so little. It also opened my eyes to the joy and happiness you can have with out all of this "STUFF". It's made me realize that Jesus is really all we need. I went to Target yesterday and felt so guilty to be spending money. I DO want to sell everything I own and just live in a cave. BUT I also realize that God has blessed me so I can bless others and I take that seriously. Scott and I since we got married never give each other Christmas gifts. Our church has a Christmas store where we supply toys and then families can come and shop for their children. 800 families are expected to come this year. Scott and I always go shopping and spend the money we would have on ourselves to buy toys. I can't tell you how much more joy I get from that than from opening some present I don't need. I'm not sharing about my giving to "brag" on myself because I'm embarrassed at how little I do after seeing how big the need is. We are working at giving more than ever. I'm sharing because I want to give you some ideas and then I would love today in the comments if you would share ways you give. I know not everyone has spare money these days - but I've always said giving of your time is harder than giving out money sometimes. Volunteering at a local shelter or food kitchen is a great way to give. When I met the girls at the Arkansas Promise House - home for teen mothers - I was burdened for them and I sent them a lot of baby stuff and plan to send another big box next month. We have planned for months that for Harper's birthday we are going to ask for NO gifts but instead that people bring items off a list we provide that the Ronald McDonald House in Tulsa could use. We were so blessed to stay there during Harper's NICU stay that we want to bless them in honor of her on her birthday each year. We have donated to them and will continue to. We also support a young couple from our church each month who are serving in Asia through Campus Crusade. We haven't been called to serve over seas but I am so excited to help those who are! You can always find opportunities to give or mission trips to go on through your local church and I urge you to explore those opportunities! YOU CAN NEVER OUT GIVE GOD!!!!! I am a Kindergarten teacher in TX and each year, my class votes and raises money to donate an animal through the Heifer foundation. I discuss with the students how this animal will benefit kids just like them. They always get excited about it and we always raise more money than we ever expect. I think this helps the kids to see just how fortunate we are and how we can have a giving heart! I teach at a private Christian school in Atlanta and each year our class is responsible for a service project to help others. I love seeing the looks on my students' faces when they realize the impact they are making in the life of someone else! What a great post! Hi Kelly! We just had a Compassion sponser table at our church and me and my husband are praying about sponsering a child. We also don't give each other gifts at Christmas, but write each other notes on how much we love each other and how blessed we are to have found each other (I know kinda of sappy but we love looking at the notes all during the year). We are currently converting our land into farmland so we can give food to people in need. We have prayed and prayed on what God wants us to do and so far He has lead the way and provided for us to get materials and chickens and live stock. It was kind of scary at first but we have faith that this is what God wants. So I am a city girl turned country girl by God, ha ha. I could go on and on on how much we have changed in the last year with cutting costs and God wanting us to help others less fortunate. I have been blessed with a sweeet husband and I have a loving family, so why not help others in need. Thanks for sharing about your Compassion trip!! Have a wonderful day! WOW is all I have to say!! I have been so inspired by you and this trip. I want to sponsor a child so bad. I think it would be such a good experience for my 7,9 and 19 year old children. I just don't know if we can afford it right now. I will say that we have just adopted a baby girl from foster care so I feel like we are making a difference right here!! Who knows where she would have ended up, I think about that a lot! Wow! I have definitely been challenged! Once again--you are such an encouragement! I sponsor 2 children in Africa through Watoto and World Vision. Sometimes I am tempted to stop when I am budgeting...but realize that there are so many other things that I can give up. You have such a great servant's heart. I appreciate your words. Sometimes we need to look around to see how much we HAVE. Sometimes the problem of poverty seems so big that you think that your little dollar won't be a drop in the bucket. But if you put it together with everyone elses dollars, we can make a difference! You are a wonderful woman and I hope to bump into you in a Target parking lot one day to help you...you have inspired me to reevaluate my relationship with our Lord and I must tell you, I am so much better for it. Keep up the Lord's work and taking care of beautiful Harper! What a great post! And thank you for sharing some great examples of giving! Blessings to you! You have such a sweet heart, Kelly! I was just listening this morning to a sermon about giving and how in James, Jesus tells us to sell stuff we own in order to bless other people. You remind me of that! Blessings! I love that you are encouraging others to step up and help. My husband and I don't do any kind of gifts for each other. However, we spend lots of energy picking out gifts from www.worldvision.org for the needy. It's an organization like Compassion and we sponsor two little girls from Africa. It's an absolute blessing to our family. We also give these gifts (chickens, cows, water, food, school, etc.) to our siblings who already have everthing they want. Wow...what timing. I just posted a blog post on compassion and loving others. Great post, Kelly! i def agree with your last statement, that you can't outgive god! awesome things that you are doing thru compassion and other ministries! i love the post below too, harper is just a doll. maybe she needs to meet my lil lucas who is 9 months :o) they'd be PERFECT together. HA! seriously, i know you pray for her future husband and i also pray for my boys future wives. isn't it awesome to know that god already has plans for them 20+ years from now?? southern love and prayers from alabama! Hi, Kelly! Great post! I wrote a few days ago to tell you that I signed on to sponsor a little girl in El Salvador after reading your past posts and the links to Compassion International. I'm happily awaiting my packet of info on Nathalia. I did have a question: do you have an on-going tally on how many readers you convinced to sponsor a child? I am still considering sponsoring a little boy, too, because there's one in particular I can't get off my mind. I have long been one to feel embarrassed to receive a gift when I already have everything I need, so this cause has made me really happy, and I'm trying to convince others to make the commitment as well. I would be that person who would want to shower my child's family with all kinds of things, so I'm glad that the organization wants to control that and limit to things they KNOW the child and the family NEEDS. If people in our country would limit themselves more to what is NEEDED instead of material desires, we'd have a lot more to share with those less fortunate. God bless you for promoting this cause! we too have been blessed. Last night a local girl called me, she has a new baby girl, and she needed gas drops. Sure I had some but we had used out of them but she did not care. She did not have the money for them. It was hard for me to imagine this, I mean they were just gas drops, but people with no cars and no means, to them every little thing is a lot. I knew Aidan did not have any kind of communicable disease and we did not use these now so I sent them to her along with other baby items that were neutral. It is hard to imagine some things however small they may be, we take for granted. I know I do. We do little things throughout the year - donating to Shriner's Hospital (my daughter is a patient), filling Christmas stockings for Florence Crittenden (a place for pregnant women that are in some pretty awful situations), filling boxes for Operation Christmas Child, raising money for Grin Kids (a local radio station's foundation that takes very ill children and their entire family to Disney World for a week long trip all expenses paid) and probably others too. There are so many different ways we can help. Thank you for sharing your Compassion story. great post! i love giving as well- it's always on my heart! i love how you and scott don't buy each other gifts and donate those to your churchs store. we lost our 2nd child, Andon, in February, and we are going to buy toys to donate w/ the money we would of spent on him. I have really enjoyed reading your posts about Compassion. Thank you for sharing about such a wonderful mission. ITA, it's so much better to give than to receive. My husband and I are working especially hard to make sure our four children understand that as well. "Stuff" isn't what brings each of us joy, it's moments in time that we share with others. Such a moving post! It really motivates people to give---both financially and with their time. 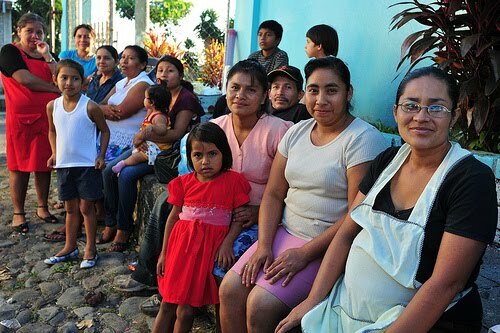 Is Compassion in other countries, or just El Salvador? Thanks for sharing your heart and for being so encouraging! There are so many needs...and you are right... We can't out give God! I posted about this on my blog about 2 weeks ago; we got far more out of this project than we gave. Perfect for bible study groups and other groups with a desire to serve others. Kelly you are an amazing and giving heart! I will read more about Compassion and see about making a donation. Thank you for all that you do. Hi Kelly, there's so much need out there, it's wonderful that you're bringing attention to it and making people think on how to give. My kids and I have always chosen a family to bless each Christmas. For example, one year it was our dear friends who lost their son in an accident. ANother year, the neighbor whose husband died of cancer. We are now sponsoring a little 3 year old through Compassion in the Phillapeans, after reading about Angie Smith's experience with Compassion on her blog. There's also a wonderful organization I've belonged to for many years, where I sponsor children going through cancer treatments by sending weekly cards, letters, and once-a-month gifts. www.chemoangels.com is the name of the organization. There are so many in need, from our hometowns to halfway around the world, it's just a wonderful thing that you're doing by sharing your experiences and blessings. I've really enjoyed seeing your photos and all you've shared regarding your experience with Compassion. There is such joy that comes from doing something for others. It seems like God just blesses us more each time we give so that we can give more the next time...I love that about Him! We have sponsored a child through Compassion for the past three years. Sorrawit was born the same day we got married and he lives in Thailand. Right now I'm working with the "Wish Upon A Star" toy drive through the Partnership for Strong Families (foster care agency). The goal is to gain support from our community and local churches so that every foster child gets at least two presents for Christmas this year. To whom much is given much is required...God has been so good to us and I'm always looking for new ways to bless others and share His love. Thanks for bringing awareness to ways people can give to others! I've been reading your blog for a couple of months now but this is the first time I've commented. I loved following your compassion trip and look forward to hearing more about compassion in the future! Kelly, that is a wonderful idea you have for Harper's first birthday! For my daughter Jaden's third birthday we asked all of the families coming to bring pajamas and new books for an organization called The Pajama Program. Then we took a photo of the kids with all of the stuff they brought to donate. Jaden was so blessed by having friends over that day for a fun party that she never once mentioned not getting any presents. I will always use the picture we took of the kids and the donations they gave as a reminder to my children that it felt so good to give to those who need it more than we do!! It felt good to do that rather than giving them silly candies or post-it notes with our names on them. Thins they would never use and probably throw away. What amazing ways to give back. Thank you for putting it out there for us. Sometimes the thoughts just leave us or seem crazy, but seeing that it works hopefully will allow this "giving bug" to take root in our lives. Thanks for those answers, Kelly. I dunno about that first one, though. Of the bloggers this round, you're really the only one who has major traffic. I think they most often like to go with the same few bloggers. I have been following your blog for awhile and always enjoy what you have to say and I feel like I have gotten to know you so well thorugh your blog. I wish to meet you in person one day. I was wondering if I could email you. I have some questions that might be to long to post on a comment. They are just questions about blogging and such. my blog is http://theclarks-nicole.blogspot.com/ THank you so much for being such an inspiration to so many women. here is my email address coleyclark30@yahoo.com, but I will email you as I just saw your comment posting. What an awesome idea for Harper's birthday!! I work for Head Start schools, a preschool for low-income families. I do a Christmas thing every year and buy presents for a bunch of families. All my family and friends pitch in and help providing clothing and gifts for these children. It is so sad when you ask a child what they want, and they respond socks and underwear....It is such a great feeling doing this every year! Kelly, I cannot find your email address. Can you post it for me. Thanks a bunch. Thanks for sharing Kelly. My husband and I have been to Thailand and Mexico as part of mission trips and it really is the hardest/best thing to do. It's amazing to use your gifts God gives you and bless others the way you can! Thank you for the wonderful Q&A! You inspired me to sponsor a child through compassion. It's been on my heart for quite sometime to go on a Missions Trip someday. There's always a timing for everything and praying and believing that one day the doors will be opened for me to be able to do that. What a great post Kelly!! We donate adult clothes, clothes Kelcee has outgrown, tons of baby toys Kelcee has outgrown to my Mi-Mi's church or our local charity organization! We also donate furniture, etc. We try to sponsor a child for secret santa, and we donate to our local food bank for the holidays!! Also everytime I see the Salvation Army person ring the bell I always give something! I let Kelcee do it too! She loves to do this!! Kelly, this was a wonderful post. You hit the nail on the head. We are a one income family and have been without a job for 18 months now. My husband has worked sporatically but none at all since September. Jobs are so dried up in our area, and he is willing to do anything! My point is that even though we are in those circumstances, God has taken care of us and by some miracle we have managed to stay in our home. We have one daughter in college and another about to go with two boys still in school For the first time in my life I know what it feels like to "receive" food from the church pantry and so forth. But you know what? In the middle of all that, God still has laid giving on our hearts and we have begun to do more and more of that. Well, now Kelly, I'm quite a bit older than you and a little old-fashioned I suppose but I just believe the Bible means what it says. You cannot out give God and that, no doubt, has a lot to do with the way God blesses you and Scott. I don't say that to puff your ego. I say that as a Biblical fact. I know in my case, He has never failed. I know it has a reason we are going through this trial. I know the good that comes from it. You can't imagine the fun we have when you take money out of the picture. Once upon-a-time, before I was married, I was a very vain, very materialistic girl. I was also a Christian and have been all my life. God has taught me many things. No, you don't need to feel ashame because you have so much, but you do need to keep it in its correct perspective and I am sure you know that. We take what we do have, whether little or much, and use it to bless others. I really believe that pleases God. Because no matter how little I think I have, I am an extremely blessed woman in so many ways. God gives me the desires of my heart. I have the most wonderful husband and children, who are all dedicated Christians serving God. I would not take any amount of money for that. I have an idea . . . Not that you need anything else to do on your blog, but what about people submitting job openings that they know of in their area? Obviously, I am aware of the lack of jobs, and think that would also be something good to network and share. I am certain we are not the only family out of work! Just an idea! No matter what, I enjoy your blog. I enjoy reading about your love for your daughter and relate so much. My first one was a girl and I adored her just like you do Harper. Actually, you will adore them all, how every many you have but that first one is special. My oldest daughter is in her first year of law school. Oh, how God has blessed us! I love you, Kelly!!! I loved reading about your trip...through my tears! Thanks for inspiring all of us! This is so inspiring! I'm a member of the Junior League of NWA and we help out with the Children's House here, but reading this makes me realize how I need to do even more for them. I also feel like I'm blessed WAY beyond what I deserve, which I think makes it even more important to give back. It's so good to know there are organizations like Compassion out there! Kelly - thanks so much for this post. I have recently been convicted regarding Christmas, the true meaning of Christmas, and how as abundantly blessed people, we have commercialized the holiday meant to celebrate the birth of Christ to the point that Christ is hardly the focus anymore. I felt as if I was turning Christmas into another reason to celebrate myself. Ugh. Beginning a couple of years ago, I stopped buying Christmas gifts for everyone. Instead I gave a donation to Living Waters in my family's honor. Last year I did a homemade Christmas (baking or giving homemade cards, etc.). This year I have decided to sponsor a child in honor of my family. I have 12 people to shop for - therefore, each month my sponsored child will be sponsored in honor of one of my family members. It takes the hassle out of shopping, provides for the needs of a child and allows me to refocus Christmas on CHRIST. I've also asked my family not to give me gifts, but to instead use the money they would have spent and donate it to an organization that means a lot to them. Christmas will finally be a celebration that honors Christ in my home. I'm SO EXCITED!!! "Religion that God the Father accepts as pure and faultless is this - to look after orphans and widows in their distress and to keep oneself from being polluted by the world. James 1:27"
I have been following your compassion trip. I am very interested in this ministry. I'm going to check out there website. Thanks for sharing your story. Everyone should have such a giving heart. God Bless You! I've loved your Compassion posts, Kelly! On my b-day (10/31), I asked my blog readers to donate $5, and I would give one of my Expecting books to a crisis pregnancy center for moms considering abortion. It's a 40-week hardcover devotional for pregnant women--super encouraging and fun. I was blown away by their response. 211 books donated so far. I would love to find out more about the Arkansas Promise House. Maybe I could give some to them! I love, love, love to give and wish I could do even more. I've found though that there's almost always something more I can do than I'm doing. Thanks for sharing your heart--and for having such a BIG one! I just wanted to share that even small amounts that we consider to be insignificant can add up to be a huge blessing in an underdeveloped country. I used to be one of those single working girls who every payday would buy another piece of costume jewelry I didn't need- they were cheap, about $6 Australian. I justified it because it wasn't much, and I thought I was a pretty good giver (Pride)- ouch. One day I still remember I bought these gold edged heart earrings that were pale blue and they didn't go with anything, right then and there, the LORD showed me that that 6 bucks could have purchased one more Bible for the people of China or the Ukraine. I read an old book "Rich Christians in an Age of HUnger" and it challenged me even more not to waste and become a better steward of God's provision. Just simple things like hanging wet clothes on the clothesline, when the weather allows instead of using the dryer all the time, can save little amounts to bless others. Sorry to rave on so much, but I still remember those little blue earrings. I have loved following your trip to El Salvador. You've written fabulous and inspiring stuff!! One way that our family gives is through a Bike-a-thon event we started this past summer. Our 2nd one will be in April! My children, ages 3 and 6, were the brains behind the event. My 6 year old wanted us to adopt every abused child in the US... Since we can't do that, we came up with the idea to invite our friends out to bike - paying $5 per biker. The event provides free popsicles, gatorade, balloon animals and a bounce house. A bake sale, face painting, tattoos & hair spraying are an extra $1 each. We had 100 people come out (about 35 were bikers) and raised over $1,100 for two local child abuse prevention agencies (one of which also has a fostering division). What started with just our friends, exploded into a community event. Our entire school district will promote the April 2010 bike-a-thon! We call it for KIDS by KIDS. My children LOVE, LOVE, LOVE being a part of this special event where kids promote the needs of other kids. Thanks kelly you are SO inspiring!!! It is so great that you went on this trip! I am real big on helping those in our own area, there are people just miles away that need help too! Love your blog! Great post, Kelly! Thanks for taking the time to share about your trip, for being courageous in going, and for encouraging us to be just as courageous in the ways the Lord is leading us to be. Here's my idea for giving. Our family is struggling financially as well (pretty badly but we manage). BUUUTTT! That doesn't mean that our God hasn't provided us with all we need in our little home. And so when I was parusing Craigslist for used toys to get my girls for Christmas I saw posts from mom's asking for donations for their own children. I of course cried because I thought what could I possibly do Lord to help when I'm buying used toys myself. Then it occurred to me to go through some of my daughters old toys and find those worth gifting. To date I've been able to help one mom give gifts to her children this year. Never in my mind would I thought financially we could afford christmas for us let alone another family. But God makes all things possible. I'm learning not to limit God. So inspiring! I need to give more. I am beyond blessed and need to give back to someone, mainly to tell God, thank you, again. I don't find you to be "bragging", it's inspiring. We visit Costa Rica pretty frequently. My father in law has a farm down there. We have made several friends in that area. One of the ladies volunteers at a local school and an orphanage. Each year when Walmart has all their school supplies on sale (i.e 5 cent notebooks and 20 cent crayons) our family buys a bunch and ships them to the Guanacaste province of Costa Rica. Each season we also ship the clothes that my kids have outgrown down there. Last year we hand delivered our clothes and school supplies. My kids were in shock! Most high school kids have never seen a textbook. 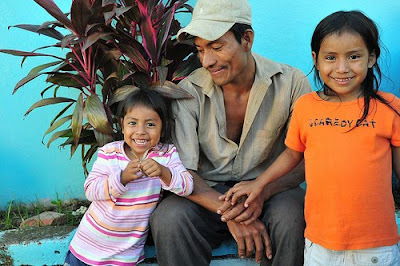 The children who are in the orphanages are better taken care of than the ones who aren't. It's a very poor area. When my kids were handing out their clothes to the Costa Rican children they were in complete disbelief, but it warmed their hearts to see these children slip their worn clothes over the ones they had on and dance around the yard, showing off their "new" clothing! My kids still talk about it today. And each season when we pack up our used clothes, we pray over them, that they will bless the children who receive them. 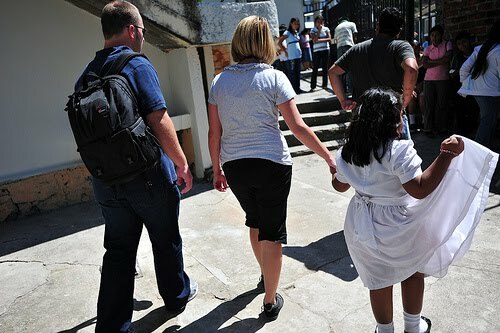 We are going back this next summer to do more mission work in the schools. I love instilling a giving heart in my children. I want them to understand why we give. And how Jesus gives to us. It feels so much better to give than receive!! I want to give more but always have excuse after excuse. I too have toyed (no pun intended) with the idea of asking for no gifts for my daughter's birthday but donating the toys she would receive to those in need of them. You have inspired me to do just that! Kelly you are truly an inspiration! I volunteered time at a Ronald McDonald House in college as part of my degree plan. Upon graduating from college I accepted the job as their volunteer coordinator. I truly loved that job and the blessings it brought me each day. I had to leave that job due to the amount of commuting I did to and from work. Someday I hope to go back and work their again. We do not live close enough for my family to volunteer our time regularly but do often purchase things off their "wish list" to send. I have planned on starting to do the same thing with my daughters bdays. My hubby and I have talked and decided we would start this when they were old enough to understand what was happening, hopefully making it such a part of them that it is what they look forward to doing on their birthdays. Thanks for inspiring me to be a better person! Kelly, I have to tell you that this post has been such a testiment to me today. I read it twice because I just couldn't believe it all the first time. Not that I was impressed with you, although I am, but how hard it is for me to say "I want to do that too" I pray my heart will change and I will want to give back what I have been given. My husband and I just recently got married (1 year and a half ago) and went on a strict budget to buy a house, do renovations etc. I feel like sometimes I am such a slave to the budget that I forget that so much is saved, but not spent on what is NEEDED. I needed so badly to hear this today. Thank you! Thank you so much for sharing your Compassion Trip with us, Kelly. You and the bloggers that I have been reading over the last week or so, have inspired me to begin sponsoring a sweet child from Rwanda this week. Thank you so for being such a bright light for the Lord! Hey Kelly! I live in Charlotte where your Sunday School teachers are moving to. My husband, son and I go to Carmel Baptist church here and it's a WONDERFUL church with such loving and caring people! Please tell them to visit us one Sunday! One very practical thing I do that is very inexpensive is use Extra Care Bucks at CVS. I roll them over and have two large boxes of personal items. A few months ago I made up some individual gift bags for the local women's shelter. I am working on some for men at a local mission. I also simply give items to people who are in need. I got a lot of free school items which I gave to a friend who is a caseworker and she distributed them to her families. Sometimes people are not blessed with finances to give, but something like this is a great way to give back. Walgreen's also has a program and there are websites that give suggestions and extra coupons to add on and make items even more economical. We give to the area food bank. It's sad to think that children in our area (Jonesboro) go hungry. Today we had a food drive because our food pantry is out of food. I made my kids help hand in the items, one is 5 and the other 2, so they understand the importance of giving back. You ARE so giving! That is a great idea about Harper's first birthday. I just get tired of STUFF. You know what I mean? That is so awesome. That is something my parents impressed on me for as long as I can remember, we are blessed so that we may bless others in Jesus' name. I don't do much, but I hope the small things I have done amount to some thing, even if small, in someone's life. Each year, my husband and I do an adopt an angel for Christmas. I also contribute annually to the local backpack drive at the beginning of each school year. I was wondering if there are any programs that you know about for children in the states? I know that with the troubled economic times things are rough for many families. I've been couponing and have been able to purchase gifts for children for Christmas thru the couponing. Although I can't do a lot, my children see that even with a little you can do something. I also think it's important for them to see that helping our neighbors and community is also important. Some people don't realize that the mom you are standing next to at the library may be living on the streets, or close to it. This was a great post! It reminded me so much of the post "Her, Here" that Angie (Smith) did after she went on a compassion trip. All the comments on that post are worth reading, too! I am staying home with my daughter right now and my husband is a pharmacist. We read the story in the Bible about a woman who spend a YEAR'S wages on oil for Jesus. I was so touched and we decided that when I return to work (probably still a while off) we will give 100% of what I make the first year to ministries/charities. We do other things, now, but they are nothing "original"--food drives, Angel Tree, ect. You are so inspiring Kelly! And I think that's a great thing that you and Scott don't buy each other Christmas presents but give money to charity instead. Maybe me and my bf of 7 years will do that when we get married. Our birthdays are in Nov and Dec and our anniversary is in Dec. So that PLUS Christmas= a lot of money spent! So I think I will talk to him about it. We never really "want" anything for Christmas anyway, just each other, ya know? So I dont think it'd be a big sacrifice. :) God Bless you! So many giving opportunities for so many in need that we are so fortunate that we 'band together as one' and do what we can do to help. One way I've been fortunate to give is by offering a portion of proceeds from some of the items I engrave which are sent to different charities at the end of each month. There are needy children at Church that I engrave bag tags for each year when this ministry is gathering school supplies for these children. I also try to help do something for these children during the holidays and of course help with our local Angel Tree Ministries. And of course Compassion, adopting a daughter for my sister with the same name as her step-daughter she lost to Cancer two years ago. She LOVES her Angela and I love being able to do this for my sister each year for her Christmas gift. It is giving that will have 'eternal' value that is close to my heart and I do what I can when I can to help anyone in need. I especially try to help families who lose homes because of fire. Such a traumatic time when there is nothing to start over with, so this is another aspect that is near and dear to me. 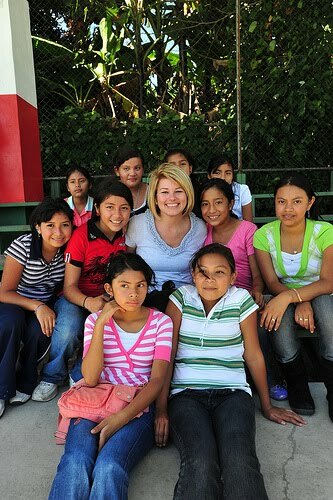 Praying for you to be blessed by blessing so many others, whether they be in your hometown or in El Salvador! I love your idea about not buying gifts for eachother but instead buying toys for others in need!! I just loved this post sweet friend... totally from your heart, and who you are!!! I am wanting to volunteer at some shelters or places around NWA over the Holidays so if you do something let me know because I want to join in. I will let you know what I hear too! Great post. For my son's first birthday, we asked that people bring a canned good to donate to the food bank. We ended up with over 200lbs. of food. I think that's a great idea that you are giving to the place that helped you while Harper was in the hospital. Hi Kelly! I read your blog everyday and I am always so blessed and inspired by the words that you share from your heart on posts like this one. Can you please give me a little more details on the Christmas store. I would love to try and get this started at my own church within our childrens department. God Bless You and your family!! I am grateful for all the commenters sharing their unique ideas to give! Kelly, I like your idea about not giving gifts for Christmas but to share with others instead. I think I just wanted to buy each other gifts just so we'd have a pile of wrapped boxes under the tree! But they can be for others! I also got inspired by someone who said they responded to a Craigslist ad to donate needed items. We participate in Freecycle (Yahoo Groups), and this is a great way to find out who needs what in your local area! Cause at first I was like, how in the world can I find a needy family to help? Well Freecycle gives you a pretty good idea. **Although I'm sure some people are just looking to mooch or scam, so be careful. I have some maternity clothes that don't fit that I just posted as a giveaway, and I'm thinking of going above and beyond and surprising the recipient with other goodies that have yet to be determined. But how fun is this?! This is a great story! I sponsor two little girls through World Vision, one in Albania and the other in South Africa. I love knowing that I am making a difference in their lives. In fact, the child in South Africa is new to me, because I had two girls in Albania, but found out recently that one of them (and her family, of course!) left the program because of a move to Italy. Before they left, I had a final thank you letter from them, saying that because of my help, they were able to move! I was sad to lose her, but know that she is having a better life now! I am hoping to go to Albania next year, to meet my other little girl, and maybe South Africa the following year! What a great post Kelly. One thing I think is great to do during the holidays is donate money in someone's name and give that as their "gift". For my grandma's birthday I spent $10 to provide a years worth of water to someone in Africa and gave her that. It is nice to buy something that you know they arent going to stick in a closet. Since Emma's brithday is in November we ask that people bring Operation Christmas Child boxes instead of gifts for her. I am a teacher and I try to take care of a few of my underpriveleged students each year by taking them and paying for them to go to the student sponsored events, eat out nights, school supplies, etc. I just signed up to sponsor a 14 year old boy in Uganda through Compassion because of you. I am so excited (!!) and feel so blessed to be able to have the chance to hopefully make a difference in his family's life for Christ's glory. Thank you for being an inspiration to more people than you know. I hope God continues to bless you, Scott and Harper.